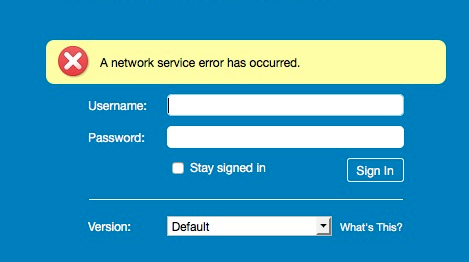 User tidak dapat login via Zimbra Web Client dan mendapatkan error “A Network Service Error has Occured” seperti gambar berikut. Issue ini terjadi setelah proses upgrade versi zimbra dari 8.0.9 ke 8.6. Dan issue ini pun bisa di bilang rada aneh. Pada saat error terjadi, dicoba lagi beberapa menit, misalkan 5 menit, user tersebut berhasil login. Dan berselang sekitar 30 menit sampai 1 jam, issue tersebut terjadi lagi. Cek log mailbox.log terdapat info log seperti berikut. 2016-06-15 08:18:38,477 INFO [qtp509886383-10137:http://127.0.0.1:80/service/soap/AuthRequest]  misc - Access to IP 10.3.129.185suspended, for repeated failed login. 2016-06-15 08:18:41,676 INFO [qtp509886383-10137:http://127.0.0.1:80/service/soap/AuthRequest]  misc - Access to IP 10.3.129.185suspended, for repeated failed login. 2016-06-15 08:18:57,173 INFO [qtp509886383-10147:http://127.0.0.1:80/service/soap/AuthRequest]  misc - Access to IP 10.3.129.185suspended, for repeated failed login. 2016-06-15 08:24:42,929 INFO [qtp509886383-10178:http://127.0.0.1:80/service/soap/AuthRequest]  misc - Access to IP 10.3.129.185suspended, for repeated failed login. 2016-06-15 08:25:17,087 INFO [qtp509886383-10211:http://127.0.0.1:80/service/soap/AuthRequest]  misc - Access to IP 10.3.129.185suspended, for repeated failed login. 2016-06-15 08:25:20,918 INFO [qtp509886383-10185:http://127.0.0.1:80/service/soap/AuthRequest]  misc - Access to IP 10.3.129.185suspended, for repeated failed login. 2016-06-15 08:25:26,236 INFO [qtp509886383-10211:http://127.0.0.1:80/service/soap/AuthRequest]  misc - Access to IP 10.3.129.185suspended, for repeated failed login. 2016-06-15 08:25:36,301 INFO [qtp509886383-10215:http://127.0.0.1:80/service/soap/AuthRequest]  misc - Access to IP 10.3.129.185suspended, for repeated failed login. 2016-06-15 08:25:40,283 INFO [qtp509886383-10207:http://127.0.0.1:80/service/soap/AuthRequest]  misc - Access to IP 10.3.129.185suspended, for repeated failed login. 2016-06-15 08:26:03,676 INFO [qtp509886383-10216:http://127.0.0.1:80/service/soap/AuthRequest]  misc - Access to IP 10.3.129.185suspended, for repeated failed login. 2016-06-15 08:26:36,992 INFO [qtp509886383-10220:http://127.0.0.1:80/service/soap/AuthRequest]  misc - Access to IP 10.3.129.185suspended, for repeated failed login. 2016-06-15 08:26:44,257 INFO [qtp509886383-10220:http://127.0.0.1:80/service/soap/AuthRequest]  misc - Access to IP 10.3.129.185suspended, for repeated failed login. 2016-06-15 08:27:16,855 INFO [qtp509886383-10222:http://127.0.0.1:80/service/soap/AuthRequest]  misc - Access to IP 10.3.129.185suspended, for repeated failed login. 2016-06-15 08:18:38,477 INFO [qtp509886383-10137:http://127.0.0.1:80/service/soap/AuthRequest]  misc - Access to IP 10.3.129.185suspended, for repeated failed login. 2016-06-15 08:18:41,676 INFO [qtp509886383-10137:http://127.0.0.1:80/service/soap/AuthRequest]  misc - Access to IP 10.3.129.185suspended, for repeated failed login. 2016-06-15 08:18:57,173 INFO [qtp509886383-10147:http://127.0.0.1:80/service/soap/AuthRequest]  misc - Access to IP 10.3.129.185suspended, for repeated failed login. 2016-06-15 08:24:42,929 INFO [qtp509886383-10178:http://127.0.0.1:80/service/soap/AuthRequest]  misc - Access to IP 10.3.129.185suspended, for repeated failed login. 2016-06-15 08:25:17,087 INFO [qtp509886383-10211:http://127.0.0.1:80/service/soap/AuthRequest]  misc - Access to IP 10.3.129.185suspended, for repeated failed login. 2016-06-15 08:25:20,918 INFO [qtp509886383-10185:http://127.0.0.1:80/service/soap/AuthRequest]  misc - Access to IP 10.3.129.185suspended, for repeated failed login. 2016-06-15 08:25:26,236 INFO [qtp509886383-10211:http://127.0.0.1:80/service/soap/AuthRequest]  misc - Access to IP 10.3.129.185suspended, for repeated failed login. 2016-06-15 08:25:36,301 INFO [qtp509886383-10215:http://127.0.0.1:80/service/soap/AuthRequest]  misc - Access to IP 10.3.129.185suspended, for repeated failed login. 2016-06-15 08:25:40,283 INFO [qtp509886383-10207:http://127.0.0.1:80/service/soap/AuthRequest]  misc - Access to IP 10.3.129.185suspended, for repeated failed login. 2016-06-15 08:26:03,676 INFO [qtp509886383-10216:http://127.0.0.1:80/service/soap/AuthRequest]  misc - Access to IP 10.3.129.185suspended, for repeated failed login. 2016-06-15 08:26:36,992 INFO [qtp509886383-10220:http://127.0.0.1:80/service/soap/AuthRequest]  misc - Access to IP 10.3.129.185suspended, for repeated failed login. 2016-06-15 08:26:44,257 INFO [qtp509886383-10220:http://127.0.0.1:80/service/soap/AuthRequest]  misc - Access to IP 10.3.129.185suspended, for repeated failed login. 2016-06-15 08:27:16,855 INFO [qtp509886383-10222:http://127.0.0.1:80/service/soap/AuthRequest]  misc - Access to IP 10.3.129.185suspended, for repeated failed login. 10.3.129.185 dan 10.3.129.186 adalah IP Proxy Server Zimbra. Setelah ditelusuri, ternyata dimulainya versi 8.5 dan seterusnya terdapat fitur terbaru untuk mencegah IP berbahaya yang mencoba serangan brute force. Bahkan IP ter-blacklist dikarenakan beberapa user memasukkan password dengan salah beberapa kali. Jika IP tersebut sudah ter-blacklist, maka akan berpengaruh pada seluruh user yang menyebabkan issue ini terjadi. Tambahkan IP server Proxy & Mailbox pada daftar IP bersih pada server mailbox. Apakah anda admin zimbra nya ? atau hanya sebatas user ?